A sketch for an Edinburgh holiday rental, to use as an avatar and postcard for guests. This is Craigwell Cottage, just off the Royal Mile in Edinburgh’s Old Town. 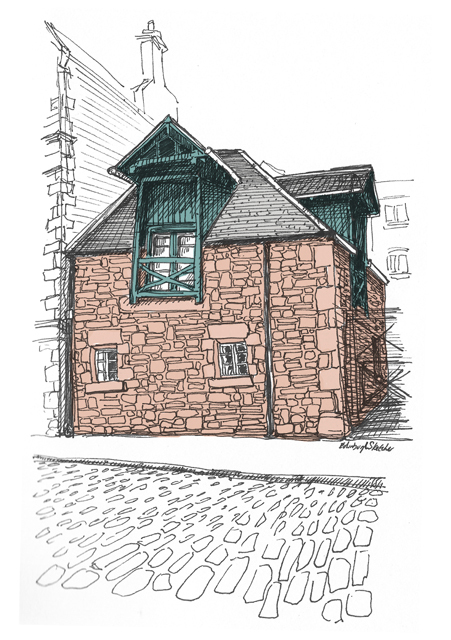 A lovely wee building which was once part of the old Craigwell Brewery, which dates back to 1822. Now a mixture of townhouses, apartments and semi-detached houses the brewery lies in between the Royal Mile, The Palace of Holyrood House and Calton Hill and would provide the perfect base to visit Edinburgh. My sketch is hand drawn in black ink with a little colour added digitally. As with all commissions the original sketch comes with a high quality digital version on CD, ready to print or use online. For more information about Craigwell Cottage visit their website HERE.